It was for the European Semester 2017/2018 that the European Commission included the European Pillar of Social Rights for the first time after its proclamation. In this framework, the Social Scoreboard, which accompanies the pillar, has the potential to outline social problems across the EU. However, this potential is not fully exploited. The member states are reluctant to use it. Budgetary objectives as well as those related to increasing the member states’ economic competitiveness are dominating social objectives. Only if social objectives are in line with the aims of economic coordination, they have a chance to be included into reform recommendations. To achieve the “social ‘triple A’ rating” (Jean-Claude Juncker), the aims set out in the pillar as well as the process of coordination in social policy need to become more binding. On 6 December 2017, the European Commission presented a roadmap to develop the Economic and Monetary Union further, which includes the establishment of a European Monetary Fund and the new post of a European Minister of Economy and Finance. In the following months, the initiative has been the subject of some controversial plenary debates in the German Bundestag. 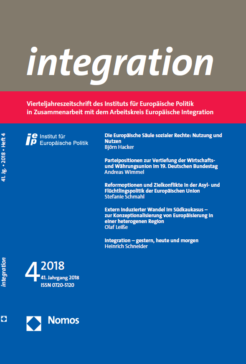 This article analyses whether party positions on the Commission’s proposal correspond more with general attitudes towards European integration or with stances in (national) economic and fiscal policy. The results illustrate that the positions are almost completely in line with party economic policy guidelines while the European integration dimension is secondary in the case of conflict. Hence, a return to the pro-European consensus that has characterised the German party system for decades cannot be expected since ideological differences in the economic left-right dimension will most likely remain an essential component of party competition. The migration movements in recent years have aggravated the continuing weaknesses of the Common European Asylum System. In particular, the member states located at the external borders of the European Union have largely been left alone with their responsibility for border control and the implementation of the asylum procedure. Therefore, there are currently seven legislative proposals from the European Commission aiming, on the one hand, at unifying the legal parameters to strengthen the Common European Asylum System. On the other hand, the proposals tend to overshadow humanitarian concerns. Their focus is rather on preventing illegal migration and coping with mass influx. The article chronicles the development of the European Union’s asylum and refugee policy and gives a critical assessment on the current reform initiatives. Europeanization processes take also place in countries of the Eastern Partnership which do not have an accession perspective. However, the European Union supports actively the transformation of the post-soviet states and stimulates democracy, political and economic stability, and the participation of civil society. This contribution argues that Europeanization is successful only if domestic actors back this process without concrete incentives and if they have the chance to interact. Since the situation in the countries of the Southern Caucasus is quite diverse, Europeanization will probably make the region more heterogeneous.